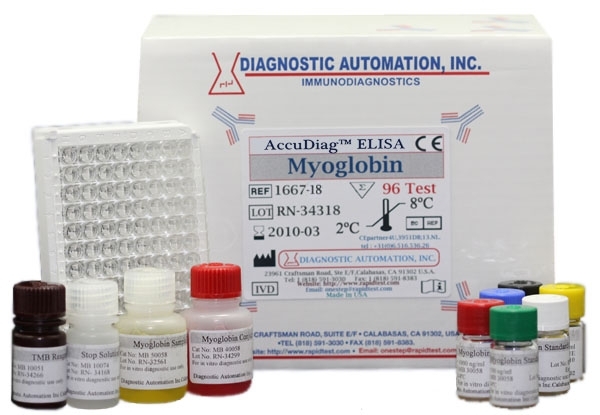 CK-MB ELISA kit is an Enzyme Linked Immunosorbent assay for the quantitative determination of Circulating Creatinine Kinase (MB-Isoform) concentrations in human serum. Creatinine kinase (CK) is an enzyme, found primarily in muscle and brain tissue, which exists as three dimeric isoenzymes of CKMM (CK-3), CK-MB (CK-2), and CK-BB (CK-1). The CK-MB isoenzyme, accounts for 5 to 50% of total CK activity in myocardium. In skeletal muscle, by contrast, it normally accounts for just 1% or less, with CK-MM being the dominant form, though the percentage can be as high as 10% in conditions reflecting skeletal muscle injury and regeneration (e.g. severe exercise, muscular dystrophy, polymyositis). The CK-MB isoenzyme exists as 2 isoforms: CK-MB1 and CK-MB2. Laboratory determination of CK-MB actually represents the simple sum of the isoforms CK-MB1 and CK-MB2. CK-MB2 is the tissue form and initially is released from the myocardium after MI. It is converted peripherally in serum to the CK-MB1 isoform rapidly after symptom onset. Normally, the tissue CK-MB1 isoform predominates; thus, the CK-MB2/CK-MB1 ratio is typically less than 1. A result is positive if the CK-MB2 is elevated and the ratio is greater than 1.7. Serial measurement of biochemical markers is now accepted universally as an important determinant in ruling in or ruling out acute myocardial infarction. CK-MB is one of the most important myocardial markers (in spite of not being altogether cardiac-specific), with well-established roles in confirming acute myocardial infarction (AMI) and in monitoring reperfusion during thrombolytic therapy following MI. In this test CK-MB calibrator, patient specimen or control is first added to a streptavidin coated well. Biotinylated monoclonal and enzyme labeled antibodies directed against distinct and different epitopes of CK-MB are added and the reactants mixed. Reaction between the various CK-MB antibodies and native CK-MB forms a sandwich complex that binds with the streptavidin coated to the well. After the completion of the required incubation period, the enzyme-CK-MB antibody bound conjugate is separated from the unbound enzyme-CK-MB conjugate by aspiration or decantation. The activity of the enzyme present on the surface of the well is quantitated by reaction with a suitable substrate to produce color. 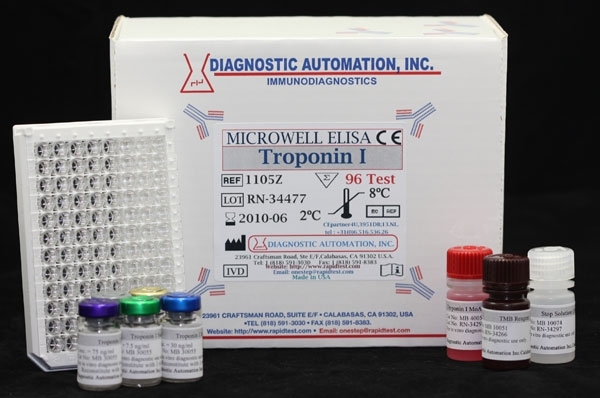 The essential reagents required for an immunoenzymometric assay include high affinity and specificity antibodies (enzyme conjugated and immobilized), with different and distinct epitope recognition, in excess and native antigen. 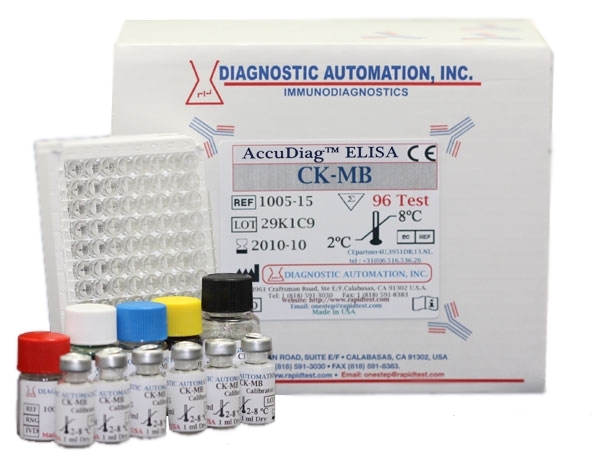 The within and between assay precision of the CK-MB DAI ELISA test system were determined by analyses on three different levels of pool control sera. 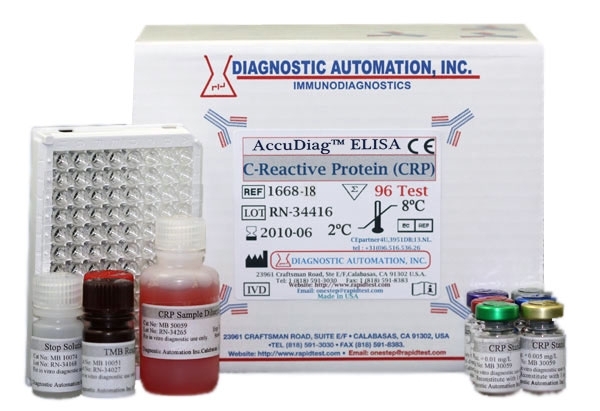 The number (N) mean value (X), standard deviation and coefficient of variation (C.V.) for each of these control sera are presented in CK-MB Elisa data insert Table 2 and Table 3.
radioimmunoassay assay. Biological specimens from population (symptomatic and asymptomatic) were used. (The values ranged from N/D- 86ng/ml). The total number of such specimens was 124. The data obtained is displayed in CK-MB data insert Table 4. The sensitivity (detection limit) was ascertained by determining the variability of the 0ng/ml serum calibrator and using the 2 standard deviation (95% certainty) statistic to calculate the minimum dose. 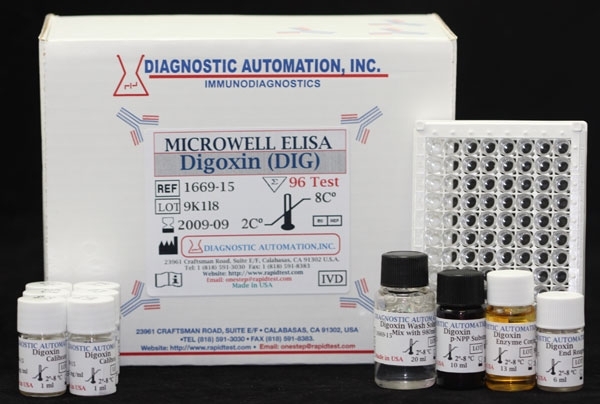 The assay sensitivity was found to be 0.5ng/ml. The cross-reactivity of the CK-MB DAI ELISA method to selected substances was evaluated by adding the interfering substance(s) to a serum matrix at various concentrations. The antibody system used did not detect any CK-BB or CK-MM isoforms even when tested at very high concentrations.